Bread is my weakness. Always has been and always will be. 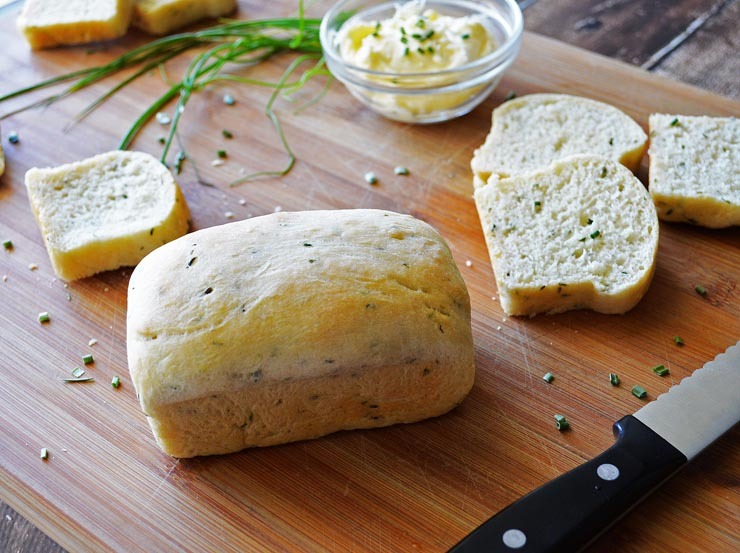 And I love this easy recipe for Sour Cream Chive Bread. We made it with vegan ingredients (Almond or Coconut Milk from So Delicious, vegan dairy-free sour cream from Tofutti & vegan margarine from Earth Balance). 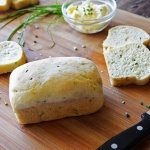 It is a savory bread with a mild chive undertone. We sweeten it up a bit with some vegan margarine + agave. This is optional but soooo good! We took the recipe for one standard loaf and portioned it into 6 mini loaf pans (if you have followed me for awhile, you know I love to freeze little loaves of bread like this). 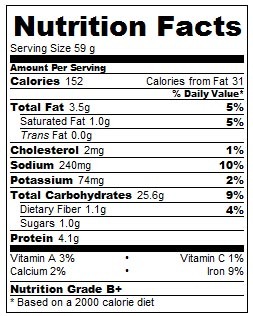 However, since most people will more readily have the standard loaf pan, that is how I calculated the nutrition. Baked until golden and delicious! I always have to try it warm. There is nothing like bread straight out of the oven. Yum! In the pan of a bread machine, place all ingredients in the order listed. It's important to let the cold ingredients get a little closer to room temperature before using. 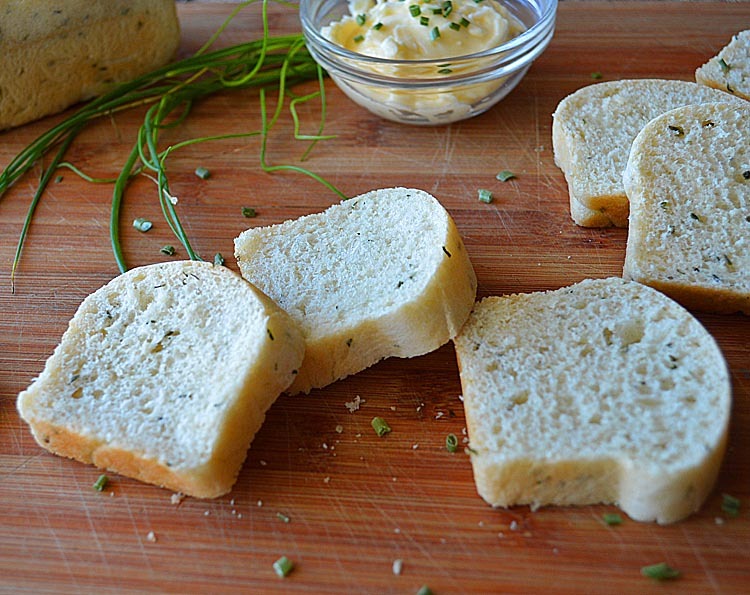 It doesn't have to be perfect, just not straight from the refrigerator to the bread machine. Place on the dough cycle (or follow instructions above if doing this without a bread machine). 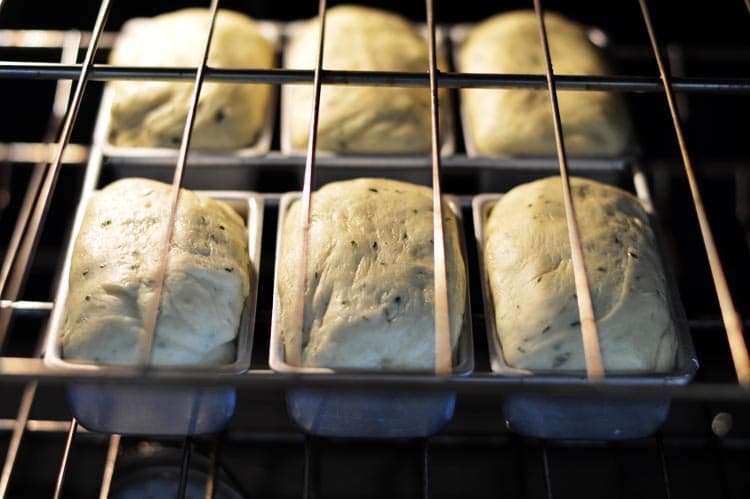 Spray loaf pan with cooking spray (or minis as we used here today) and form the dough into the bottom of each pan. Cover and allow to rise for 45 minutes in a warm, but not hot, area. I usually preheat the oven and set the covered pans on the stove top to capture some of that heat. Once risen, bake at 350 degrees for about 20-30 minutes (depending on size of pan used) or until golden. Allow to cool in the pan for about 15 minutes. Remove to a rack to continue cooling. Try serving this bread with vegan cream cheese or softened vegan margarine sweetened with agave as we did here. 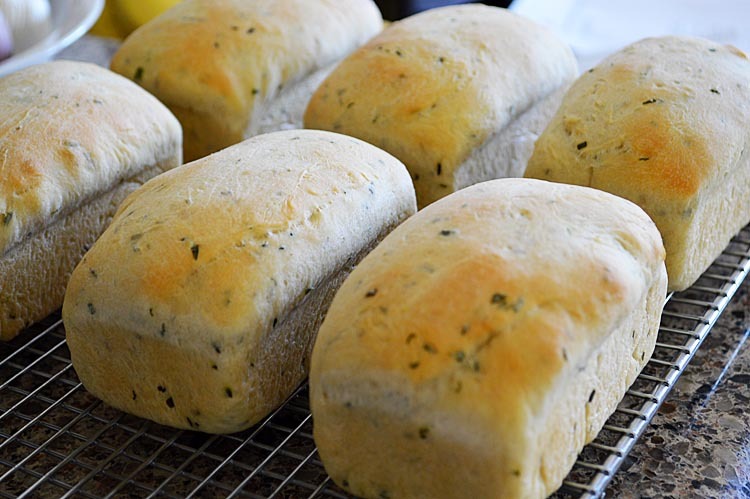 This recipe makes 1 standard loaf, or 6 mini loaves. Nutrition is based on 1 standard sized loaf cut into 12 slices. These are sooo cute! I saw them on reddit and fell in love. You should post this recipe to Healthy Vegan Fridays. If you don’t already know what it is, it’s a blog party that I just started co-hosting. We could use some more cute things like this on there. Check out my website for more info. I don’t have electric mixer and bread machine. Only I have is oven. Pls assist how to make a dough in this case. I loved ur recipe and it will be my first ever bread baking at home. I’m so excited to bake it right. Please help.